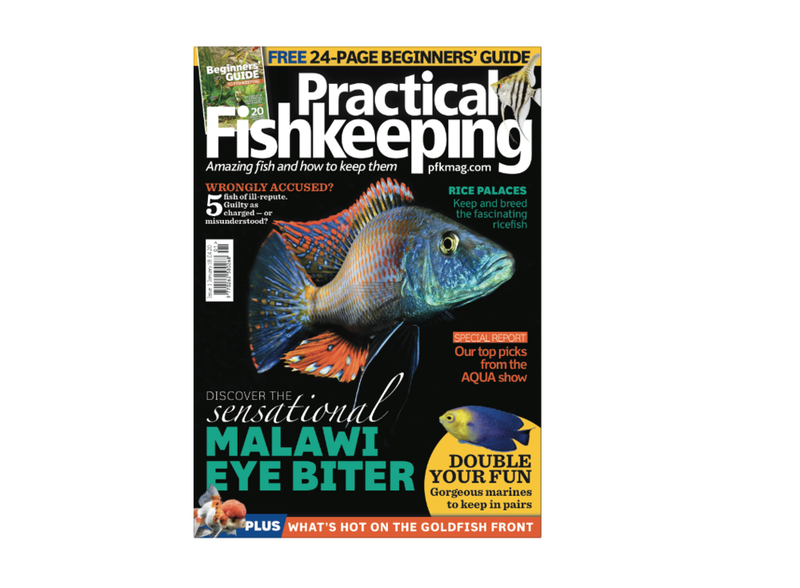 The January issue of Practical Fishkeeping is on sale now! The January 2018 issue of PFK is packed from cover to cover with all your favourite fish, plus amazing aquariums, inspirational ideas and essential advice — plus a FREE 24-page beginners’ guide to fishkeeping. Our fish of the month are the dainty ricefish — easy to keep, fascinating to breed and they don’t need acres of space. Find out everything you need to know about these rock stars of the science world. Meanwhile Gabor Horvath gets reacquainted with a first love — discover the burning beauty that is the Flame tetra. We spotlight five alleged community ne’er-do-wells ­— are they truly the underwater version of the Kray twins, or just misunderstood? Find out what’s hot on the fancy goldfish front when we visit the UK’s leading supplier. If saltwater is your thing, why not consider keeping a pair of fish? While many marine species are best kept singly to avoid conflict, there are some which do very well in pairs — and they may even breed for you! Discover some of the best choices. Artemia have featured in South Park, NASA has sent them into space, and they’re a great live food. Don’t miss our guide on getting the best out of these incredible crustaceans. We look at the kit you’ll need for an emergency fishkeeping toolbox, there’s a guide to buying a secondhand tank and our Diploma series covers disease issues and how to tackle them. Plus, you can discover some of the highlights of the AQUA 2017 trade show in our special report. Your FREE 24-page beginners’ guide includes all the information you need to set up your first aquarium. If you’re already an experienced fishkeeper, why not pass it on to a friend or relative and introduce them to the wonderful world of fish? All this and much more in the January issue — on sale now! Order your December copy today for free first class delivery to your home. Or why not subscribe to the magazine? Check out our latest subscription offer and save yourself money!